"Concentrated tone, an intensely personal vibrancy, finely expressive shading: these were [Seinemeyer’s] leading characteristics. If we look for a (relatively) modern counterpart, I would hazard Julia Varady, or a generation earlier, Gré Brouwenstijn. And even then something would remain that is Seinemeyer, individual and irreplaceable. The collection opens with one of the rarest and most sought-after of her recordings, the aria of Elisabeth from the last scene of DON CARLOS. First, she remembers it is a prayer, not a prima donna’s command; then she takes the melody tenderly, with a restrained passion gaining all the time in tragic urgency." 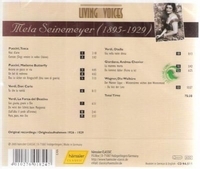 “Despite her short life, Meta Seinemeyer achieved great success as a singer. Her recordings were among the few that Walter Legge recommended his wife, the great Elisabeth Schwarzkopf, listen to as examples of style and lyricism. Her voice was a light dramatic soprano which, if she had lived longer, might have developed into a full dramatic sound capable of singing Brünnhilde and Isolde. Her recordings display an uncanny control of long legato phrases and great dynamic variety.